Pollution resistant and wildlife friendly. Privet (Ligustrum ovalifolium) is an almost indestructible and very popular choice for topiary and hedging. Easy and relaible, privet is fairly quick growing and soon forms a decent hedge and will grow virtually anywhere. Glossy green leaves and creamy white flowers are attractive to butterflies and birds - normally evergreen, it only loses its leaves in the very coldest of winters although soon bounces back to lush growth in the spring. 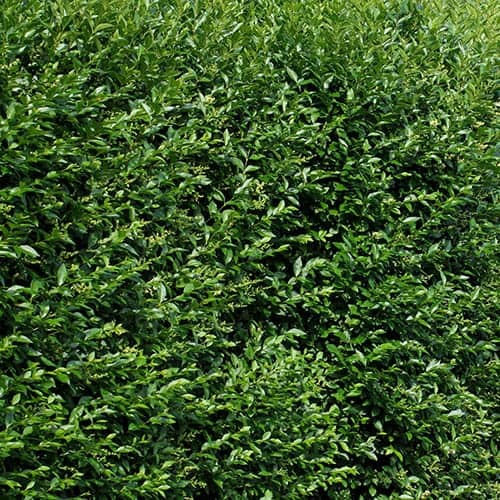 Easily trimmed a couple of times during the summer to encourage the formation of a dense, formal garden hedge. Supplied as 60cm-80cm tall 2 litre potted plant. A very popular and good choice for a quick hedge, and it is almost always evergreen, so keeps its foliage in all but the coldest of winters, so is techniclaly classed as 'semi-evergreen', although they always come back bigger and stronger with new spring growth anyway. Keep trimmed 2-3 times a year, for a tight and neat finish, but if you do let it go, it responds well to very hard pruning and hacking back! In summer it has pretty creamy clusters of fragrant flowers too as an added bonus. Plant 3 per metre of this size, Please call us for larger quantity discounts. Supplied as 60cm-80cm tall 2 litre potted plant, to plant October to April. Keep well watered after planting in dry spells. PP&I fixed at 6.99 for any Quantity ordered.